Celebrations Tuxedos is a full service in stock and now In Home/Online Formal Wear Company. Just launched in 2018… Where We Come to You! Yes, We Deliver! Serving all of Rhode Island and South Eastern Massachusetts. Contact us: for a No Obligation Consultation and Fitting at 401-766-7797. Wedding Fittings by Appointment. Need a tuxedo, shirt, bow tie, vest or for any of your formal wear needs rental or retail, we ship, as well as deliver… Just call! No Worries about picking out the perfect tuxedo for that special occasion. 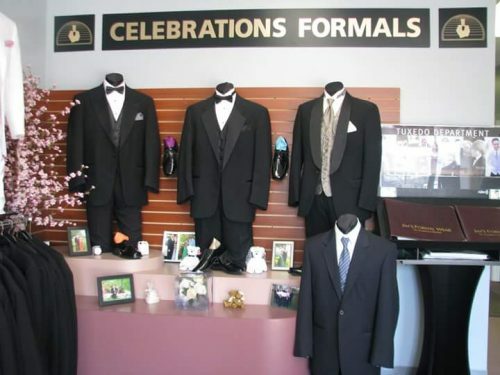 At Celebrations Tuxedos, we give you personal service! We have been in the Tuxedo business (storefront) for over 32 years and recently closed our storefront location with the move of everything to online. We decided to launch a convenient IN HOME/ONLINE SERVICE WHERE WE COME TO YOU! We feature some of the top Designer Tuxedos and Suits for rental and sale. Names like Michael Kors, Ike Behar, Stephen Geoffrey, Allure Men, Tony Bowls , After Six, Perry Ellis, John Yves… just to name a few. We feature Modern Slim Fit, Ultra Slim fit, Skinny fit and Big and Tall sizes. We are able to fit everyone with sizes ranging from Toddler, Boys size 2 – Men’s size 74 Long. We add some fun socks, colored shirts, stylish colored suspenders for a unique fun look. We pride ourselves on our award winning service and our expert knowledgeable friendly staff. Our philosophy is simple… the customer is number one with us and we strive to get the most accurate measurements to ensure a perfect fit for the special look, on your special day. We are totally dedicated to that end. We are an Elite dealer with Jim’s Formal Wear and Sarno and Sons, the largest formal wear network for your wedding with over 5000 locations Nationwide. We match all David’s Bridal colors and more. We can also give you same day service in most cases for that last minute tux rental. PLEASE USE THE TUXEDO LINK BELOW TO VIEW STYLES AND TO PLAN YOUR WEDDING OR EVENT! We provide Tuxedo and Suit rentals for Weddings, Proms, Quinceanera, Black Tie Events, Destination Weddings, Anniversaries, Cruises Elks, The Knights, Masons or Just for that night out on the town! If it’s Forma, give us a call! *LARGEST TUXEDO, SUIT AND COLORED VEST SELECTION IN THE AREA! *BECOME A PROM REP FOR YOUR SCHOOL GET YOUR TUX AND PROM NIGHT FOR FREE (call and ask for Jim for details) All YOU HAVE TO DO IS PASS OUT COUPONS AT YOUR SCHOOL.. THEY COME IN AND GET A TUX YOU GET PAID .. THE MORE YOU GET TO COME IN, THE MORE WE PAY FOR YOUR PROM COST INCLUDING TICKETS AND LIMO ETC! *WE WILL MEET OR BEAT ALL COMPETITORS PRICES ON A COMPARABLE TUXEDO! *WE ALSO HONOR ANY AND ALL COMPETITORS COUPONS! *WE WILL MATCH MOST ANY COLORS! CELEBRATIONS TUXEDOS – CELEBRITY IN HOME SERVICE – WE COME TO YOU ! *WE SCHEDULE AN IN HOME CONSULTATION BY APPOINTMENT TO MEET WITH THE BRIDE AND GROOM TO PICK OUT STYLES , MATCH BRIDESMAIDS COLORS AND MAKE A PLAN ! *WE GIVE YOU A SAVE THE DATE FOR YOUR FITTING – PLAN A GUYS NIGHT OUT AT THE GROOM’S HOME OR ANOTHER CONVENIENT LOCATION! *WE DELIVER YOUR TUXES FOR TRY ON- 2-3 DAYS BEFORE YOUR WEDDING TO A DESIRED LOCATION! *CURRENTLY IN HOME/ONLINE SERVICES ARE PROVIDED TO YOU AT NO EXTRA CHARGE! YES, FREE! *EASY- CONVENIENT – NO TRAVEL – NO HASSELS – NO WORRIES- JUST THE CELEBRITY TREATMENT! CREATING MEMORIES ONE CELEBRATION AT A TIME !